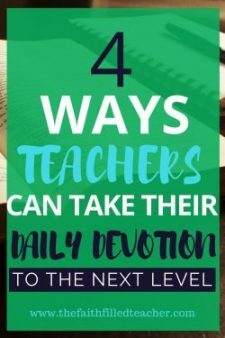 A teacher’s prayer habits greatly influence their day. Having a little talk with the Lord first thing in the morning is definitely what I recommend for every Christian teacher. The way you start your day has a huge impact on how the rest of your day goes. I don’t know about you, but when I talk to God and spend some time with Him in the morning, my day just goes better. It helps me feel refreshed and in a good state of mind. I feel ready and prepared to take on whatever the day brings. Prayer gives you that extra umph that you need to say to your day, “Okay, bring it on!” Failing to pray and spend time with God before getting your day started is something you want to avoid. It’s like a superhero leaving the house without their cape. Now, I’m not saying that skipping your morning prayer and quiet time is the end of the world. God is not going to leave you because you didn’t do your morning devotion. The Word says that He’ll never leave us. He lives on the inside of you. It’s really more about your mindset and your flesh (the human part of you). This is the part of us that is in the battle all day long. Your thoughts affect your mood and your speech. So taking the time each morning to focus on the Lord, His promises, and His love puts your mind in the right place. 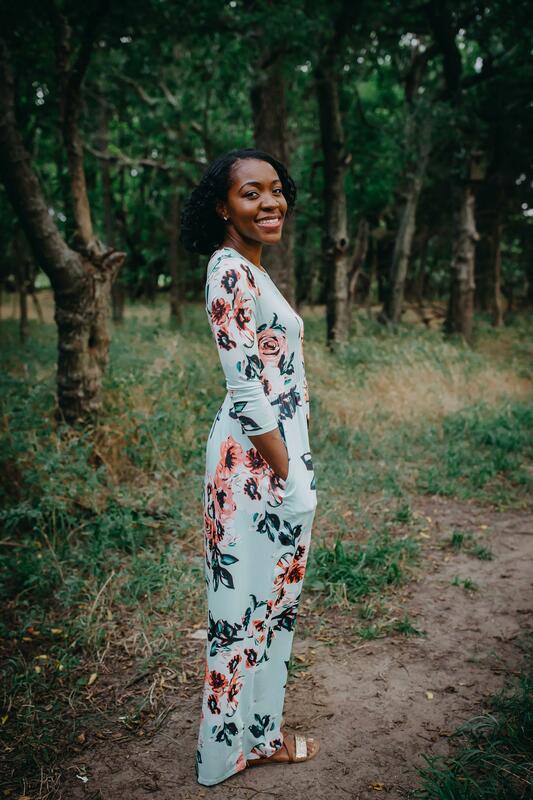 Spending a few minutes talking to God, laying your burdens at His feet, thanking Him for being so great, reminding yourself of what His Word says about you and bringing the needs of your loved ones before Him…all of this puts your mind the right position. Preparation is a key part of being a successful teacher. Yes, map out your lesson plans and make your copies. But your soul needs to be in a good state as well. This is where a teacher’s prayer life comes in. As Christ followers, we are to pattern ourselves after the life of Jesus. In the New Testament, we can see that Jesus constantly communicated with His Father. He intertwined His life with prayer. Your students don’t need you snapping at them for asking to borrow a pencil. They need love, grace, and patience. So to prepare yourself to be at your best in the classroom, here is a teacher’s prayer for every morning. 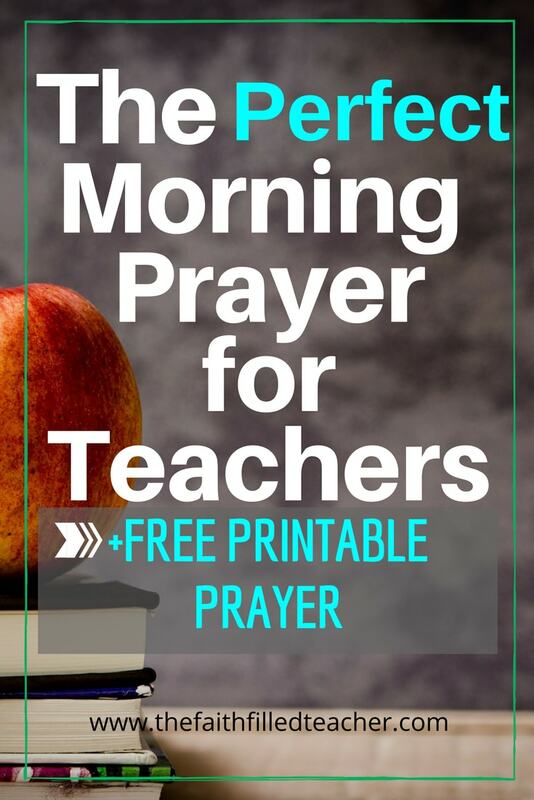 In this prayer, you will find the structure for what I feel every faith-filled teacher needs to start their day off right as they walk into their classroom. 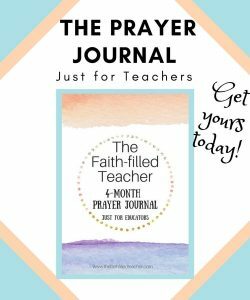 When I was thinking about this prayer the Lord led me to think about our bodies and how a teacher should properly prepare their body to be at work for the Lord in their classroom. I pray that my mind is aligned with your Word. Help me to guard my mind and take any negative thoughts captive. As I start my day, give me a refreshed and renewed perspective. The state of your mind is so important. Like I mentioned earlier, your mind (your thoughts) influence your actions and your speech. Getting your mind on track and in line with the Word of God is to me, the most important step. You are called to be the light in your classroom. Followers of Christ should operate differently than those in the world. You can keep yourself in line with God’s way of doing things by renewing your mind. Make it your desire to renew your mind with God’s Word. Let go of the negative events that occurred the day before. Pray that you would have new mercies for your students. Psalm 141:3 (NKJV) Set a guard, O Lord, over my mouth; Keep watch over the door of my lips. My words are powerful. I pray that the words I speak to my students and those around me are words of life. Help me to think before I speak. Your words are powerful. You can make or break a student’s day with what you say to them. Pray that your mouth would be in check throughout the day. Pray that your words are encouraging and not discouraging. Allow the Lord to lead you as you instruct your students. Remember, the Holy Spirit is available to us all things (John 14:26). Tap into His power and use that wisdom to speak life into your students and instruct with the utmost prowess. I pray that my heart is pure. Help me to be aware when I’m storing evil in my heart. God, help me to guard my thoughts. For I know what I think on gets stored in my heart. The heart, mouth, and mind are all connected. What you think gets stored in your heart, and what’s in your heart comes out of your mouth. When you deal with your students you want to speak life to them. Pray that your heart would be pure so that your words would uplift your students. Psalm 90:17 (NIV) May the favor of the Lord our God rest on us; establish the work of our hands, yes establish the work of our hands. I pray that your favor rests upon me as I teach. God, I am your instrument. Establish what I put my hands to and work through me as I instruct my students. Pray that the grace and favor of the Lord be at work within you each day that you walk into your classroom. Allow God to establish every work of your hands. Every lesson plan, activity, and project. Make this your one desire each day: to please God with everything you put your hands to. Pray that everything you do is established in Christ. If you seek to please God first and foremost, His grace will rest upon you and empower you to teach with excellence. When God is your foundation everything else will fall into place. Trust Him. God, order my steps as I teach today. Help me to be led by Your Spirit as I deliver instruction. When I get stuck on how to help my students, help me to remember that you’re here to guide me. Pray that God orders your steps throughout the day as you teach. Ask the Lord to guide the steps in your instruction. This includes what you teach and how you teach it. Pray that God’s ultimate lesson plan would override any plans you may have. 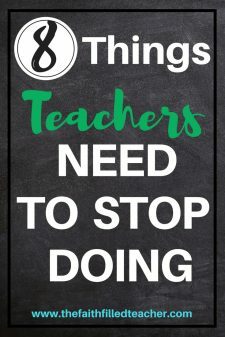 You are the one that sets the tone for what goes on in your classroom. Because of this, it is important that you in are in the right frame of mind as you serve your students. So each day, before your students enter your room, make sure you pray a prayer for yourself. I pray that this blesses you! What are some other ways you get yourself prepared spiritually for the day? 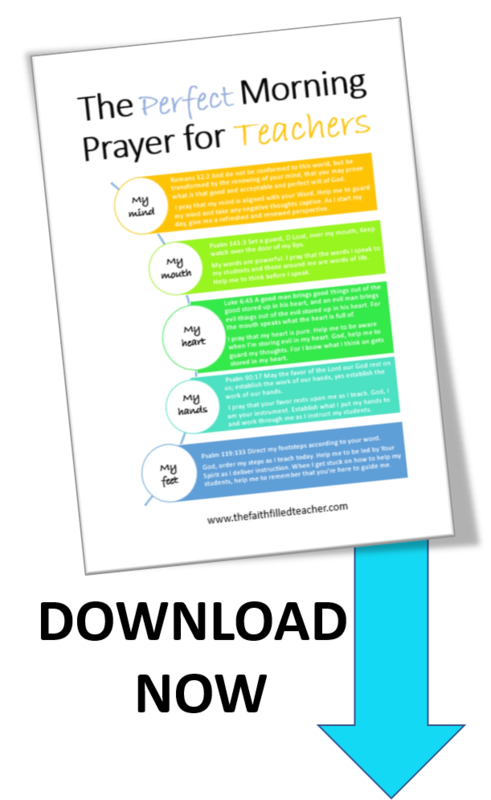 Don’t forget to grab your FREE PRAYER PRINTABLE BELOW!